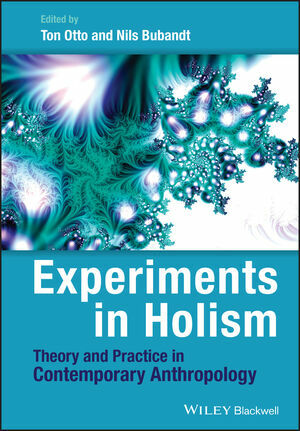 Experiments in Holism: Theory and Practice in Contemporary Anthropologypresents a series of essays from leading anthropologists that critically reexamine the relevance of holism as a foundational tenet of anthropology, and its theoretical and methodological potential in today's world. Ton Otto is Professor of Anthropology and Ethnography at Aarhus University, Denmark, and Professor and Research Leader at The Cairns Institute, James Cook University, Australia. His most recent publications include the co-edited volumes: Tradition and Agency: Tracing Cultural Continuity and Invention (2005, with Poul Pedersen) and Warfare and Society: Archaeological and Social Anthropological Perspectives (2006, with Henrik Thrane and Helle Vandkilde). Nils Bubandt is Professor of Anthropology at Aarhus University and co-editor-in-chief of Ethnos. He is the co-author of Imagining Nature: Practices of Cosmology and Identity (2003, with Andreas Roepstorff and Kalevi Kull), and has published numerous articles on topics such as forgery, witchcraft, globalization, and conflict. 1. Anthropology and the Predicaments of Holism (Nils Bubandt, University of Aarhus and Ton Otto, The Cairns Institute, Queensland). Part 1: Rethinking Holism in Ethnographic Practice. 2. Beyond the Whole in Ethnographic Practice? Introduction to Part 1 (Ton Otto, The Cairns Institute, Queensland and Nils Bubandt, University of Aarhus). 3. Holism and the Expectations of Critique in Post-1980s Anthropology: Notes and Queries in Three Acts and an Epilogue (George E. Marcus, Irvine, CA). 4. Worlding the Matsutake Diaspora: Or, Can Actor–Network Theory Experiment With Holism? (Anna Tsing, University of California, Santa Cruz). 5. The Whole Beyond Holism: Gambling, Divination, and Ethnography in Cuba (Martin Holbraad, University College London). Part 2: Beyond Cultural Wholes? Wholes are Parts, and Parts are Wholes. 6. Beyond Cultural Wholes? Introduction to Part 2 (Ton Otto, The Cairns Institute, Queensland and Nils Bubandt, University of Aarhus). 7. The Whole is a Part: Intercultural Politics of Order and Change (Marshall Sahlins, Chicago, IL). 8. Lingual and Cultural Wholes and Fields (Alan Rumsey, Australian National University). 9. Deep Wholes: Fractal Holography in Trobriand Agency and Culture (Mark Mosko, Australian National University). Part 3: Beyond Structural Wholes? Encompassment, Collectives, and Global Systems. 10. Beyond Structural Wholes? Introduction to Part 3 (Nils Bubandt, University of Aarhus and Ton Otto, The Cairns Institute, Queensland). 11. Louis Dumont and a Holist Anthropology (Bruce Kapferer, Institutt for Sosialantropologi). 12. From Wholes to Collectives: Steps to an Ontology of Social Forms (Philippe Descola, Collège de France). 13. Holism and the Transformation of the Contemporary Global Order (Jonathan Friedman, Lund). Part 4: Beyond Social Wholes? Holistic Practice: Cosmology, History, and the Continuity of Life. 14. Beyond Social Wholes? Introduction to Part 4 (Nils Bubandt, University of Aarhus and Ton Otto, The Cairns Institute, Queensland). 15. Proportional Holism: Joking the Cosmos Into the Right Shape in North Asia (Rane Willerslev, Moesgaard Museum, Hojbjerg and Morten Axel Pedersen, Københavns Universitet). 16. One Past and Many Pasts: Varieties of Historical Holism in Melanesia and the West (Eric Hirsch, Brunel University and Daniele Moretti, Brunel University). 17. Drawing Together: Materials, Gestures, Lines (Tim Ingold, University of Aberdeen).